The Mercedes AMG GT range is already seven models wide, from the 476bhp roadster to the 585bhp R-series coupé – but now Affalterbach has revealed the most extreme entry yet: the GT R Pro. On paper it’s been slapped with new tech, toys and a £40,000 price hike to match – and in person it looks more like the GT4 racer it sits underneath than ever. So, we know what you’re thinking, ‘is the GT R Pro an AMG A45 better than the cheaper AMG GT C?’ Let’s find out. 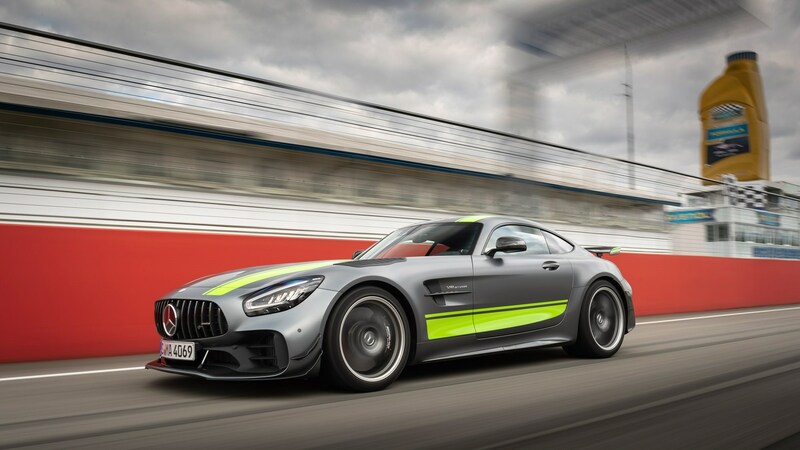 The price increase seems steep, because the Pro shares the same engine and transmission as the GT C. But we’re told the PRO was tuned to shine on the circuit, not in dense traffic or over pock-marked surfaces, and helpfully, Mercedes has based this event at the Hockenheim race track. If there is an argument for the Pro pack, this is where it’ll be most obvious. So what do you get for the price of another, smaller AMG model? Part of the package are riveting carbon-ceramic brakes, beefier Cup tyres (275/35R19 and 325/30R20), trick rear-wheel steering, an electronically controlled limited-slip differential, selectively blocked air intakes which help to maintain a constant engine temperature, active aero, a performance exhaust system, the AMG track package complete with bucket seats, a rear roll cage – and seemingly more carbonfibre bits than BMW uses for an entire i3. But this is isn’t one of those super-lightweight specials. 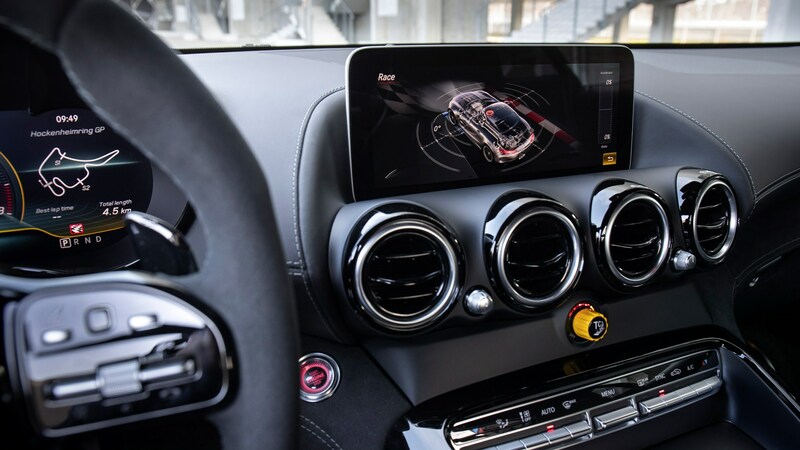 Rather than stripping out the luxuries you’d find in the other AMG GTs, inside, the marketing department has insisted on keeping the full dose of mod-cons including a Burmester sound system, and any other convenience you can think of. Outside, the changes are a little more obvious. At the rear, you’ll find a fixed wing tall enough to slice low-flying birds, and at the front, there are DTM-style double-decker flicks attached to the front bumper. A lowered ride control sports suspension keeps the front splitter precariously close to the ground, too. For all other purposes but going fast round a race track, you are probably better off adjusting the damper setting from Sport Plus to Comfort. If this won't do, compression and rebound can be tweaked in three stages by twisting a dial on the shock absorber from above or from below or on both ends. The multiple DTM champion Bernd Schneider is one of two instructors taking us round the Hockenheimring; a mixed bag of boring flat-out straights and challenging series of quick to very fast bends. At this track, three qualities make all the difference: the stopping power on the approach to the two second-gear kinks, traction when accelerating out of the slower bends, and the cornering grip through the twisty Motodrom section. The carbon-ceramic rotors do a splendid job absorbing kinetic energy in time-warp mode. You can drop the hammer almost as late as in a VLN car, and fading is not an issue when you pit for a breather as frequently as we did. The confidence-inspiring pedal feel is all about absolute stamina to the point of self-abandonment. 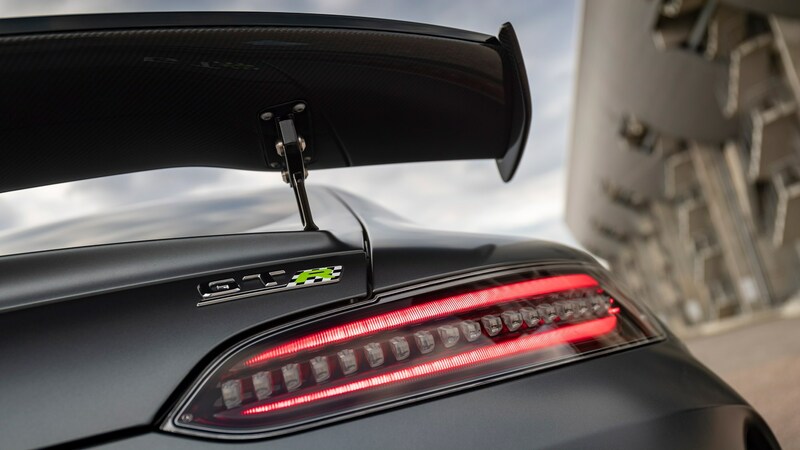 When we start our turn with the ESP in the Race handling mode, electronic torque-vectoring and the nine-stage traction control struggles to put the power down promptly in second, but the forward thrust is back in full force in third. Low-speed turn-in is brisk and positive, and reservation to let this beast fly fades away fast. By mid-afternoon car and driver have fused to one optimistic and increasingly ambitious whole. After four hot laps; that's all we get per stint to protect the tyres, one thing is crystal clear: the PRO is not a McLaren 570S beater, not a rival to the Huracan RWD, nor a contest for the 911 GT2 RS. Instead, the two-seater coupé conceived in Affalterbach is exactly what the badge on the tailgate says: a Gran Turismo, but with a twist. 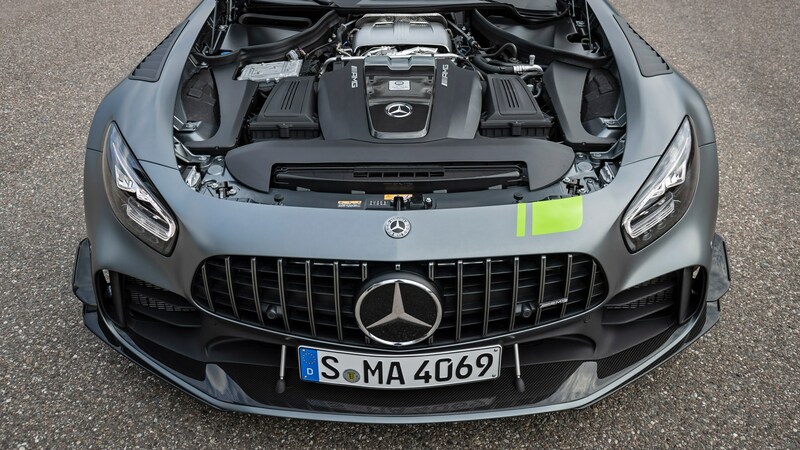 The massive 516lb ft torque summit spreads from 2100 to 5500rpm, which is another way of saying that the 4.0-litre twin-turbo V8 is as good at wafting along in a tall gear as it is at chasing revs all the way to the 7000rpm redline. Capable of accelerating in 3.6sec from 0-62mph and attaining a maximum speed of 198mph, the PRO is surprisingly only one tenth quicker off the mark and one mph less fast overall than the admittedly not as well equipped but £55,000 cheaper 557bhp GT C.
It may be awesome on the track, but this isn’t an actual racing car – and therefore we’ve only sampled half the story. We’d also like to sample it on the road; over expansion joints, level railway crossings and the southern sector of the M25 – that sort of stuff... That’s where the PRO kit may be more of a hindrance than a help. So is this the best AMG GT right now? Undoubtedly, but that honour may not last for long. The limited-edition Black Series is set to arrive next year, and it’ll likely be faster, lighter and more powerful. 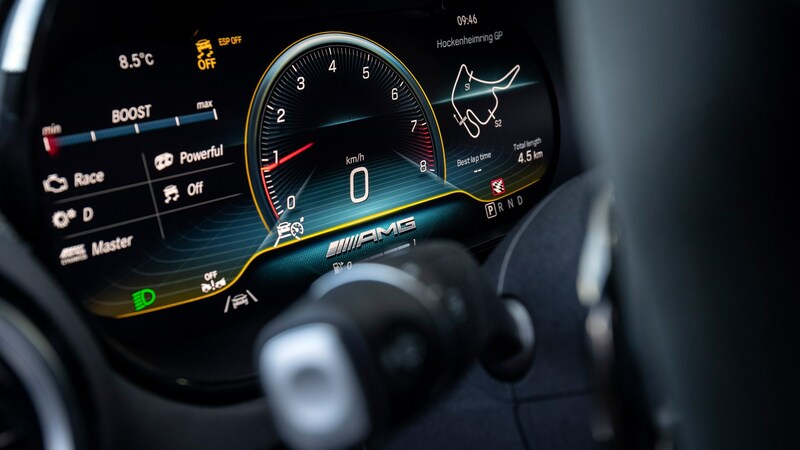 Tipped to feature the top-of-the-line 639bhp engine first introduced in the AMG GT four-door coupé, the Black Series should be able to give the leaders of the pack a good run for their money.